1945 - World War Two ends as German dictator Adolf Hitler commits suicide. His country, Nazi Germany collapsed and surrendered meaning the Allied forces must begin the rebuilding process. With Germany split up and controlled by Britain, Russia, USA and France, heavy investment was needed to pick Europe back onto its feet. The horrors of the war would be put to the back of peoples mind in 1948 as 59 nations came together in London to compete across 17 sports in the first Olympic Games since 1936. It was the second time the Olympics had been held in London and for millions of people across Europe, this signalled hope that the worst was behind them and the world could now reunite in the form of a sporting meet. The political situation in Britain in 1948 has now been described as the "post-war consensus" with little to separate the policies of the major parties. It has been argued this existed until the election of Margaret Thatcher in 1979, a monumental moment in the history of our island. Back to 1948 where major advances in welfare were taking place during the period. Perhaps most notably was the founding of the National Health Service in 1948 (following from legislation in 1946 and 1947). Sport in Britain had grown incredibly popular in the years immediately following the Second World War. With little alternatives for entertainment in a country still hit by rationing, post-war reconstruction and a changing culture. The growth in British sport can be seen by looking at attendance figures for the period. Through the late 1940s, early 1950 many clubs broke their record attendances in all sports with fans flocking to stadiums. The 1948/49 football season was the peak with the "post-war boom" attracting 41 million spectators to matches, 27 million were recorded in the last pre-war season. Holt and Mason record how rugby league too grew rapidly with 7 million fans attending the mainly northern clubs during the 1948/49 campaign, this despite the sport still being predominantly amateur. This coincided with a 50% increase in cup attendance from 1939. However into the late 1950s and the tide began to turn with figures falling significantly for a number of reasons... Perhaps the subject of a future article. So 1948: the year Mahatma Gandhi was assassinated, the year the communists seized control of Czechoslovakia, the year of the Berlin Blockade, the year the UN adopted a universal declaration of human rights but also the year the world saw a return to being united in sport. 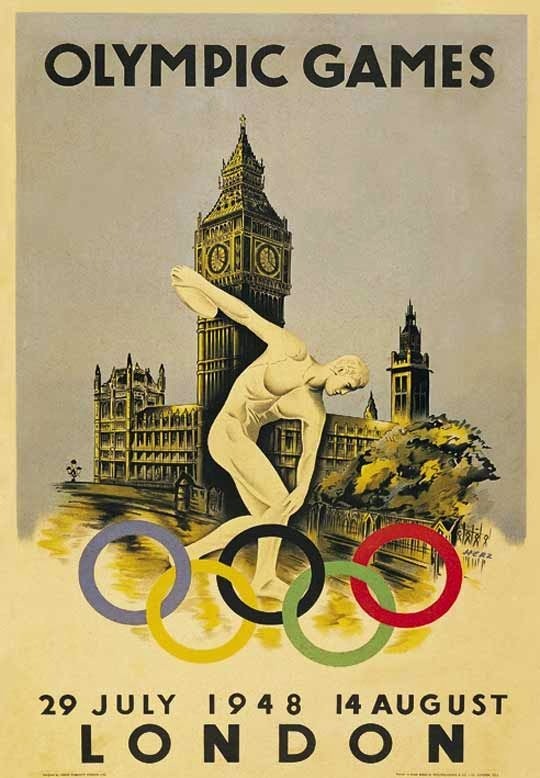 On 9 June 1939, London had been elected to host the 1944 Olympic Games. Of course by September 1939 Europe was at war and the 1940 Helsinki meet, along with 1944 in London were cancelled. The International Olympic Committee's Swedish president, Sigfrid Edström, though was keen for London to host upon their return in 1948. In 1946 the IOC decided to give London their go and the path to the "Austerity Games" was set. Finances for the 1948 Olympics are detailed in the organising committee report from 1951 which stated total expenditure as around £732,000. This figure may seem extortionately high but in fact the committee benefited from the decision not to build any new stadiums or an athletes village to house visiting competitors. This meant that by the 1951 estimates, in-fact a profit was recorded of around £29,000. The desire to keep costs low saw the American national team bringing their own food with them to the UK whilst athletes stayed in the military camps left disused from the war. Visiting supporters were also put up in people's homes, giving the competition a friendly feel. The "Austerity Games" have been labeled as one of the best of all time by those who attended and have written about it since because of this spirt of unity. For the first time ever, the viewing public would be able to watch the action on their televisions as the BBC won the rights to broadcast the celebration of sport. With the focal point of the events around the Empire Stadium and Empire Pool in Wembley, it made the BBC's job easier. The 1951 report states: "The highlights of the Wembley events were to be repeated in the Newsreel for the benefit of people who would be unable to see the " live " broadcasts during the afternoons." However, the numbers who did tune in were of course limited because of a lack of television sets owned by the common household. So now to the sport itself! 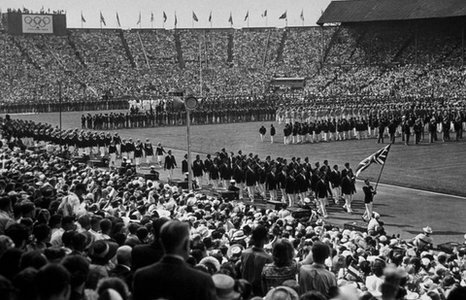 On 29 July 1948 His Majesty King George VI opened the games in front of 85,000 packed into the Empire Stadium. The traditional athletes procession took place as two weeks of high quality competition was set to take place. 136 events were to be staged across 17 sports including 33 athletics disciplines, 9 gymnastics, 8 boxing, 11 swimming and 7 rowing. 3,714 men and 390 woman would take part in temperatures over 30 degree centigrade due to a particularly hot summer. In the track and field department there were 4 debutant events with the men's 10km walk, the long jump, the shot put and the woman's 200m all new additions. It was to be of the 390 woman who would be the star of the Olympics, a Dutch, 30-year-old, housewife. Fanny Blankers-Koen was her name and the mother of two defied the odds to put on an iconic performance. Koen was born in a small Utrecht village in April 1918, taking up athletics as a youngster before going on to marry her coach, Jan Blankers. During the Second World War she gave birth to two children in occupied Netherlands and many assumed her sporting career was over. Blankers-Koen refused to give up though and despite woman's athletics being seriously discounted during this period, she forced her way to the 1948 Olympics. After a number of world records in the war years, you could be be excused for thinking the 30-year-old mother was past her best. No way, "The Flying Housewife" dominated every event she was part of, winning gold in the 100m, 200m, 80m hurdles and the 4x100m relay. Her gold medal tally could've been far higher but there was a limit of 3 individual events per athlete, perhaps for the best for her competitors. Blankers-Koen won 4 of the 9 woman's events, running 11 times in 8 days to become a superstar across the world. For fans of The Football History Boys we must of course mention the football that took place in 1948. Great Britain provided a team and because non of the home nations had ever taken part in a World Cup, this meant it was a big event on an international level. The side was managed by Matt Busby who famously coached Manchester United's 'Busby Babes' later in his career. The Brits though, were left empty handed after a 3-1 Semi-Final defeat to Yugoslavia was followed by a 5-3 loss to Denmark for the Bronze medal. Sweden meanwhile won the gold with their key players being Gunnar Gren, Gunnar Nordahl and Nils Lindholm. They would go on to become AC Milan's famous Gre-No-Li trio, which you can read about here. In terms of the medal table, the United States of America, who sent 300 athletes, dominated. As we have come to expect in Olympic games over the decades, the Americans are used to winning and notched up 84 medals: 38 gold, 27 silver and 19 bronze. Particular highlights for the States were winning 10 of 12 diving medals on offer, 15 of the 33 swimming medals, the 27 athletics medals and obviously the basketball tournament. Perhaps surprisingly Sweden came second in the table but were some 40 medals behind the 'winners' America. Team GB meanwhile were languishing in 12th place after netting 23 medals in all: 3 goals, 14 silver and 6 bronze. Great Britain were initially thought to be one of the favourites to do well but disappointed with their haul as only they only snatched two gold medals in the rowing and a gold in the sailing. There were 3 silver medals for Dorothy Manley (100m), Audrey Williamson (200m) & Maureen Gardener (80m hurdles) who were beaten by Fanny Blankers-Koen. Other silvers came in the form of cycling, the men's hockey and weightlifting. However inquests were held into the performances, particularly seeing a disappointing "anti-climax"  in the athletics that were held in such high esteem. Karoly Takacs meanwhile is an athlete that today would compete in the para-olympics but in 1948 pulled off a special gold medal victory. The Hungarian was born in Budapest and honed his pistol shooting skills in the army but was unable to compete in Berlin 1936 because of his rank. However in 1938 whilst in a training exercise, a hand grenade exploded and shattering his shooting hand. Takacs though refused to quit his sport and learnt how to shoot with his left hand. 10 years later Takacs won the gold medal in London's 25m rapid fire event  before heading to Helsinki in 1952 and once again taking the top prize! These feats have earned him Olympic history fame for facing such adversity. So there we have it, the 1948 London Olympics. A games that was held on a budget, saw athletes, spectators and organisers pull together to provide one of the best meets in the history of the competition. The Austerity Olympics shall always be remembered and not just in the Britain, the World was united in the name of sport as the horrors of war were put to bed. Read the whole (and very lengthy) report on the organisation of the Olympic Games in 1948 here. THE ORGANISING COMMITTEE FOR THE XIV OLYMPIAD • LONDON • 1948 (Published 1951), p. 19. 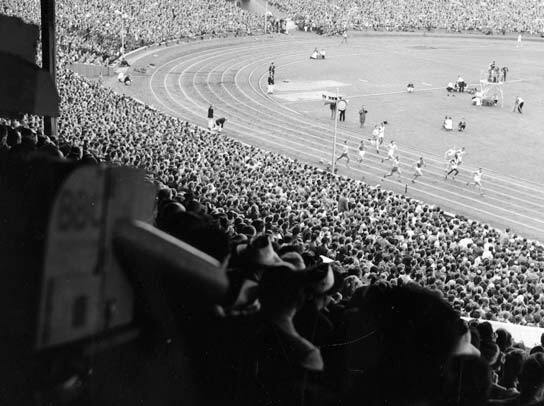 See the incredible collection of photos from the 1948 Olympics in the BBC Archives. Organising Committee Report (1951), p. 120. Aberdeen Journal, Wednesday 11 August 1948, p. 4. Accessed on the British Newspaper Archive. Olympic.org photo archive, accessed here. Yorkshire Post and Leeds Intelligencer, Saturday 14 August 1948, p. 2. Accessed on the British Newspaper Archive. LA Times, 3 September 2006, <http://articles.latimes.com/2006/sep/03/local/me-mathias3>. Olympic.org - London 1948 Olympics, accessed here.